Useless Advertising Agencies in Zimbabwe? Doesn’t matter which newspaper you’re talking about, The Herald, The Fingaz, The Zimbabwean, Daily News, Friday Ads, Metro – all full of junk adverts. Junk because they don’t have a snowball’s chance in hell of EVER getting maximum marketing results for the people who pay so much for them. It’s not the fault of the newspapers (although if I owned one, I’d do something about it) – the blame rests with incompetent advertising agencies and ignorant business people. How most business people and marketing managers are conned by so-called marketing or advertising ‘experts’. They don’t really care. Seriously. The way they got started in business. Basically some artistic someone gets hold of a nice desktop, loads some design software on it and after a whole week or two of practice, declares themselves a graphic design or worse – an advertising expert. Same goes for marketing consultants. After a short diploma, a good book or two, he feels confident to take the responsibility for your marketing results. Beware – and in many cases this is just as true for big agencies as it is for small. If you’re starting an advertising agency, or marketing consultancy there’s a better way to go about it. They don’t have to live off of their results and they never get the benefit of testing to see specifically what works. Ad agencies have the rare ‘privilege of recommending stuff and never having to be accountable for the results. The ignorance of advertising clients. When you sell bread, you’d better get it right, because your customers know what a good loaf should look and taste like. But when it comes to most services, especially marketing many clients know so little about what quality looks like that it’s easy to get away with anything. This isn’t to say they aren’t good agencies out there, they are, but very, very few and the sheer number of inexperienced, unskillful or worse uncaring agencies out there, means that you’d better know what to look for when dealing with them. What Does A Good Advert Look Like? It’s not art. It’s not about how nice your advert looks. Many ads may look good and yet be severely lacking and incapable of yielding the best results. When was the last time you bought something just because you really liked the logo you saw in an advert? A long time I’ll bet. Too bad that pretty design vs powerful advertising is a lesson that most marketing managers will never fully appreciate until they have started their own businesses and are directly living off of the results of their marketing. Of course, all of the above…how agencies work, how little entrepreneurs know and how unaccountable for results some marketing managers are – it’s all good news – if you’re one of the few who actually knows how to get massive results from your marketing. Determine who you need to reach. Who you’re talking too makes all the difference in what you say and how you say it. If you think your target market is ‘everyone’, you probably don’t know who your most profitable market is. Get Their Attention. 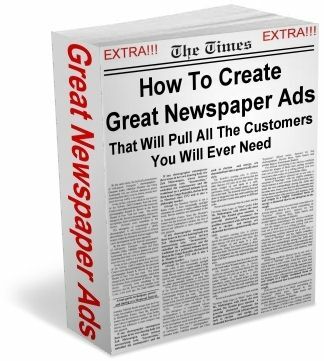 Make-sure your headline is designed to get the attention of the people you’re after. If you fail to grab their attention, your ad will under-perform. If you get everyone else’s attention except your target market, your ad will under-perform. Your logo is not your headline, neither is your company name. Get people’s attention by telling them something that’s of interest to them, not you. Build your Case. Why is your offer better than your competitors? Be specific. Why should we believe what you have to say about yourself? Why is this an irresistible offer? Why should we act on your offer now VS trying to remember to act a week from now? Tell as full a story as you can within the space you can afford. Educate your clients – they should know more after they’ve read than they did before. Determine what you want these people to do – and tell them. What’s your Most Wanted Response (MWR) – what should people do once they’ve read your advert? Call for more information or a quotation? Come into your office? Visit your website? Send an email inquiry. Immediately buy your product? Once you know your MWR, make sure EVERYTHING about your ad is designed around this – and finally make it clear to people by telling them EXACTLY how to respond. Make sure all your graphics Add to the effectiveness of your marketing. Here’s my personal rule: Only use a picture when they communicate better than words would in that amount of space. You’re paying for space – be ruthless. Remove useless or unnecessary words. Delete pictures or words that distract from your cause. Reduce the size of your logo and company name; unless you’re a mega brand, it’s the least important thing in your advert. If you’re working with an agency check for all the above. Refuse to be distracted or conned by fancy graphics and words. Check for the factors that will turn your investment into a profit – forget about everything else. very useful stuff, especially with the proliferation of ‘new’ companies springing everywhere these days, one can hardly tell which one of them can drive business to one’s company through their not so tried and tested advertising skills. Don’t you run your own marketing agency yourself? @Max Great post as usual, thanks for the brilliant advice. @ z.chinyanga Max runs the Business Setup Group dude. And he’s hands down the smartest marketer in the country! People need to know the difference between marketing and selling long gone are the days for selling i.e making and pushing your product to the customers and bombarding them with heavy push tactics. A new age is upon us to do proper market research of what the consumers want, communicate / inform them , this takes many forms, and finally close your sale. I agree with Max, your company name is not your headline, business owners tend to love to hear and see their own business names! Try using probing and buzz words such as “you” , “your” in your headline and it will definitely capture some attention. Invite your potential clients to engage with you do not assault their senses. hey guys im new here and im doing research ön zim ad agences. Can somebody provide me with a list and possibly names of directors of ad agencies. reality you are yourself not entirely certain of the point. useful info particularly the last part 🙂 I care for such info a lot.